The 30″ Evans Telescope (Pictured), owned by the Linden Observatory and maintained by WSAAG, has gone from push-to to Go-to with a full ServoCat and ArgoNavis system as well as focuser and mirror cell improvements. Read their great first light write-up! Secondly, The Astronomical Society of Victoria has had their 25″ Obsession brought up-to date in similar style with the full go-to treatment and also plenty of extras to help with those climate extremes. Say hello to Wild Thing. 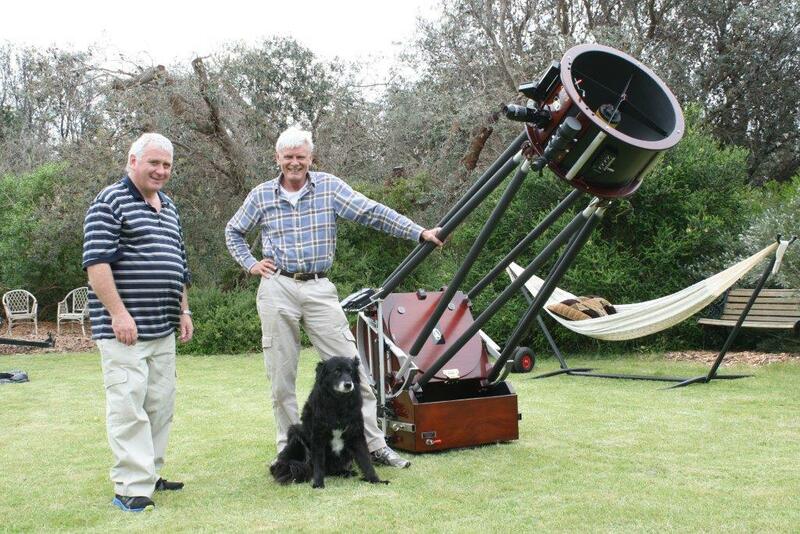 Phil Townsend is ready to rock the universe with his amazing new telescope. SDM068 is a stunning 28″ f/3.3 monster complete with every conceivable extra including multiple mirror cooling fans, remote collimation and all dressed in regal gold and purple livery. This instant classic is set to devour the night sky! Its not every day we get to follow the build of a 40″ telescope from start to end. Here we are at the very beginnings of what will become a quite magnificent metre class telescope for Mike K of Victoria. The blank is currently sat upside-down on Mike Lockwood’s grinding machine and about to have it’s back ground perfectly flat before the long job of grinding and polishing the front surface to perfection. Mike’s telescope will be an incredible f3.0 so it will certainly be a challenge for everyone involved to bring this beauty to life both optically and mechanically. Thankfully for him, there are craftsmen on two continents capable of the job, stripped and ready for action! Amy and David Heard, proud owners of SDM052 are part of a super-exclusive group of Northern Hemisphere SDM owners. Being Texans they understand that big is best and here they are in their supersized roll-off roof observatory with their appropriately large 25″ SDM. Unfortunately for the Heard’s, equally big winter weather has been keeping that roof shut with many inches of snow falling recently to spoil the fun. Soon enough those legendary Texan skies will come out to play and we are looking forward to a fantastic observing report come the spring!